Are you a mom who likes the outdoors a lot? Do you like taking your baby with you wherever you go to show him the big and beautiful world out there? Or are you a mom who needs to be out and about but do not have a sitter to help you take care of your baby at home? Whatever the reason for being out a lot, you’re a mom-on-the-go, and you need a few essential items to help ensure your baby’s safety, happiness, and cleanliness. Moms on-the-go need a diaper bag that is reliable and practical. Diaper bags are a moms’ ultimate weapon to a bad day out with baby. They carry all the necessary items moms need for changing diapers, feeding their baby, and cleaning up any mess. But what makes a diaper bag reliable and practical? A diaper bag can’t just be any other bag. It’s got to have a few key features in order to pass as mom’s best friend. First of all, a diaper bag has to have tons of space. You’re going to be lugging around a lot of items. You can’t have a bag that’s ripping at the seams. Next, a diaper bag needs to have pockets. Pockets help moms stay organized, reducing the already present stress of carrying your baby around. Another key feature is a large and easy-to-access opening. This helps moms reach into their bags with ease. Though a lot of diaper bags on the market tick all these boxes, unfortunately, a lot of them are rather unfashionable. New moms can feel self-conscious about not being able to dress up and look like themselves anymore, so a good diaper bag has to be more than just a tool. A good diaper bag doubles as a stylish accessory that fits mom’s look. Luckily, one such bag exists, and it’s the Grand Central Station Seven-Piece Set. The SoHo Collection’s Grand Central Station Seven-Piece Diaper Bag Set is, as its name suggests, a set of seven different pieces that make up a whole bag. The main compartment is very roomy, with many pockets for keeping baby’s and mommy’s items. The main compartment also has a wide opening and a zip-up closure. The strap is long enough for the bag to hang at waist-level. Inside of the main compartment fits a small purse, also with a zip-up type of closure and a strap for carrying. This smaller purse can double as mom’s main bag. The set also features a padded changing station, with a matching design to the rest of the bag in terms of color and print. The next pieces are two smaller accessory pouches that are good for holding loose items. Another piece of the set is an insulated bottle bag, fit for carrying most bottle sizes. The insulation will keep bottles warm. The last piece is a pair of grips for attaching the bag to strollers. This bag set has many pros, as each piece of the set covers mom’s every need. Grip handle has enough space so the bag can be both carried with the hands or placed on the shoulder. It has a lot of pockets that have different sizes. It has a wide closure that is equipped with a zipper. Provides enough room for you to move around and have your arms free to take care of other things. It has a handy small purse that can keep small items. The small purse has its own long strap and can be used separately. It has an insulated bottle bag that can be used for most baby bottles. The bag’s stylish but neutral design goes well with almost any outfit. A lot of diaper bags today are convertible, meaning the straps can be adjusted to turn the bag into a backpack or a messenger bag. Unfortunately, this diaper bag is only capable of maintaining one style, which is the tote-bag style. Some bag sets also come with a breastfeeding blanket or cover. Unfortunately, this bag does not come equipped with that kind of feature. This diaper bag is a seven-piece set that includes a main compartment for storing most items. This main compartment comes with many pockets inside and out, which are great for organizational purposes. The next-sized purse that has a long strap is a good bag for placing mom’s important items, while two smaller pouches help keep things neat. Also, the changing pad is there to help make the diaper or nappy changing time comfortable, clean, and mess-free. Meanwhile, the insulated bottle bag keeps drinks nice and warm to ensure that the baby receives quality and safe beverage all the time. Lastly, the stroller grips are there for easy attachment to your stroller in case your hand or shoulder get tired. It’s tough to find downsides to this bag, as it pretty much covers all the factors that a good, efficient, and reliable diaper bag should have. Its stylishness is what makes it standout, but as you can see in the long list of pros, it’s not the only feature that this bag can proudly boast. The final verdict is that this diaper bag set is a solid contender in the market of good and practical diaper bags. Not only that, it doesn’t clash with your look or style. In fact, with its elegant design and neutral but chic color palette, this bag actually compliments your outfit. 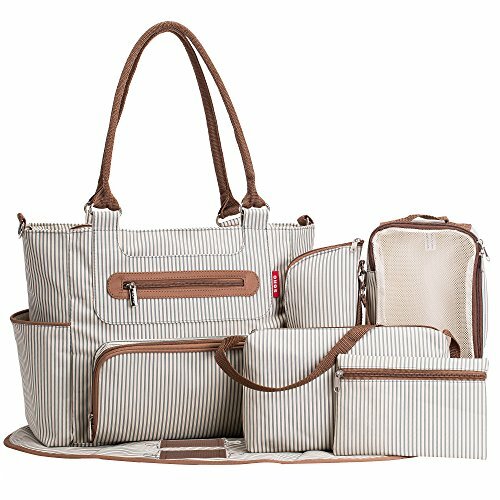 The SoHo Collection’s Grand Central Station Seven-Piece Diaper Bag Set is a wonderful bag to have if you’re a mom who’s frequently on-the-go and you need something that’ll aid you in all your baby needs. It’s chic, stylish, and practical.